The word “news” refers to an unfolding event that traders may not notice at first, although some news will move markets instantly, even when the news was expected. News about central bank decisions and related matters (such as comments on the sidelines of a G7 meeting) will move markets immediately, while others are more subtle and take time to sink in. An example is then-new Greek Prime Minister George Papandreou announcing in late 2009 that Greece had been underreporting its budget deficit. Eventually this led to a peripheral sovereign debt crisis, but nobody saw the extent of it at the time. So we have “expected news” and “unexpected news,” and both types of news can inspire trader action that is either short-term or long-term. As a rule, expected news moves markets less than unexpected news, but analyzing price behavior can become tricky and complex. A key question is how long the effect of news will last. Trading lore says: “Buy on the rumor, sell on the news.” This is as true in Forex as in equity trading. In equities, the price of a stock will go up on analyst forecasts of good earnings, but fall after the earnings announcement even when the earnings surpass expectations. The same thing happens in Forex. A currency will be bought ahead of a central bank rate hike decision that is universally expected, but fall on the announcement even when the rate is indeed hiked, exactly as expected. This seems counter-intuitive but reflects that traders who positioned correctly ahead of time are now taking profit. Therefore, you need to know your holding period with absolute conviction ahead of big news events. If you are a buyer of a currency ahead of an expected rate hike and in fact, the central bank delivers a hike, you need to endure the following drop in the currency and have a stop-loss order that accommodates the drop. Central banker speeches can roil currencies if the speaker diverges from commonly-held thinking. A good example is the long-standing principle held by the German Bundesbank that QE would be completely unacceptable for the eurozone. When Bundesbank chief Weidmann said QE might be on the table, it was unexpected news and the euro fell, even though the consensus of trader opinion is that the ECB will not engage in QE. Nobody accused Weidmann of jawboning (see below), but his comments had the same effect as jawboning. The Weidmann comment injected a new degree of uncertainty into the overall perception of the risk surrounding the euro. After QE was adopted as an official ECB policy, the Bundesbank returned to its old stance of opposing it on principle, so comments by Bundesbank chief Weidmann stopped being “news.” However, in the October of 2016, some unnamed sources told the press that the ECB might consider “tapering” its bond purchases. The euro immediately fell, even though the sources were never named and the story lacked credibility. Instead, as further data releases continued to show low inflation, ECB chief Draghi started preparing the markets for an extension of QE past the previously named March 2017 ending date, probably for six months more. The word “tapering” left the stage and was not printed again. Intervention is a special form of central bank action. Government intervention in the Forex market for the major currencies is fairly rare and had tended to be concentrated in USD/JPY over the past three decades. The Bank of Japan usually delivers a series of warnings ahead of time that mention “excessive volatility,” even when volatility is normal and what is disapproved is the too-strong level. This is named “drawing a line in the sand,” and Forex traders noisily debate exactly where the line really lies. As the price approaches the latest consensus line in the sand, you see the dollar/yen wobble in both directions. A sub-set of intervention is jawboning. Jawboning is a comment by an important government figure, either the central bank governor or the minister of finance/treasurer, saying that the country’s currency is too strong. The audience — Forex traders — are supposed to interpret the “too-strong” jawboning as implying an upcoming interest rate change or other currency-devaluing action. In nearly all instances, the Forex market is happy to oblige by selling the currency, at least for a few hours. In 2013 and 2014, we had a number of instances in the CAD, AUD, and NZD, in which jawboning had the desired effect. We also saw the effect in the GBP and euro. Jawboning is the single biggest Forex-moving news event today. It can be counted on to move a Forex price, even if only for a few hours. The only thing that would be more powerful would be a totally unexpected interest rate change that nobody saw coming, but central banks pride themselves on preparing the ground well ahead of time, so this hardly ever happens anymore. It did happen in years past but has gone off the radar screen now that central banks are sensitive to managing expectations as a core policy tool. Heading into an election, the market may have a vision of which candidate will be the best choice for a country or what effect the candidate’s platform may have on the economy. If one candidate is clearly ahead, and the market is not over positioned for a win, it may be worth taking a currency punt, but if the polls show candidates neck and neck, it may not be worth the risk. Budget negotiations or political scandals can roil FX markets also. Geopolitical events and their influence on Forex market was discussed in the previous lesson. 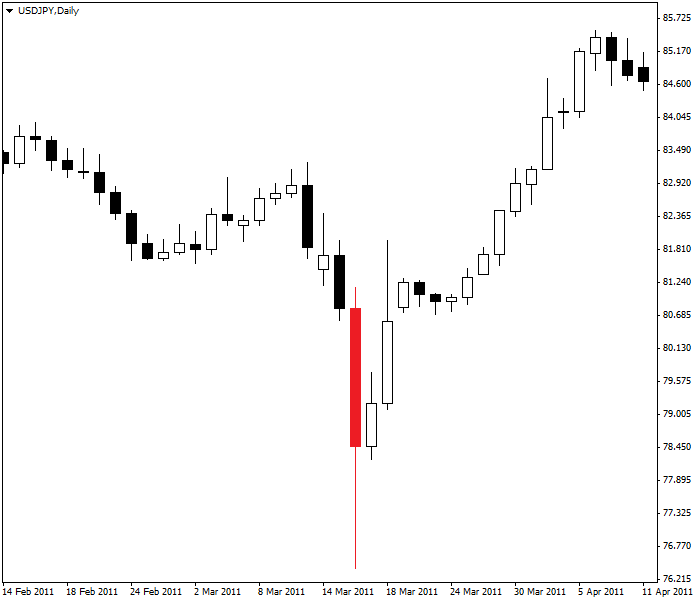 Effect of post-Fukushima flight to yen (red candle) is shown on this USD/JPY daily chart. A change in sovereign rating can either improve a country’s prospects or diminish them, with its currency rising or falling, accordingly. The Mexican peso saw steady global investor inflows after Mexico was upgraded from non-investment to investment grade in March 2000. During the US financial crisis in 2009, Standard & Poor’s lowered Mexico’s rating one notch and the peso slipped initially, but did not go far since the other rating agencies (Moody’s Investors Services and Fitch Ratings) did not adjust Mexico’s ratings. S&P again raised Mexico’s sovereign rating in December 2013. A more shocking example of ratings news was the August 2011 downgrade of the US ratings by Standard & Poor’s, from AAA to AA+. US equities collapsed and gold soared to life-time highs. The dollar, yen, and Swiss franc benefited from safe haven demand. In contrast, when a credit rating change is expected (by a series of minor downgrades to the outlook, for example), then the given currency may see little or no positive/negative effect. You can follow the credit rating changes by the top three agencies in our Forex news section. It also lists current ratings and outlooks for each currency. The 9/11 attacks in 2001 prompted a huge shift in risk sentiment from positive to negative, as did the start of the Iraqi War in 2003. After September 11, the dollar continued upward for another few days to a peak on September 18 — it was already on an upmove and initially it looked like terrorist attack was not going to affect the dollar. But then, risk aversion took over and the dollar fell until July the next year, when traders had become accustomed to the new environment — and risk sentiment began to improve. The London bombings in July 2005 weighed on sterling initially, but cable later recovered. The Madrid bombings (March 11, 2004) had a curious effect — the euro was already in a downmove, but the downmove paused for another three weeks. See the chart below. Many analysts commented at the time that the euro was displaying tremendous resilience. 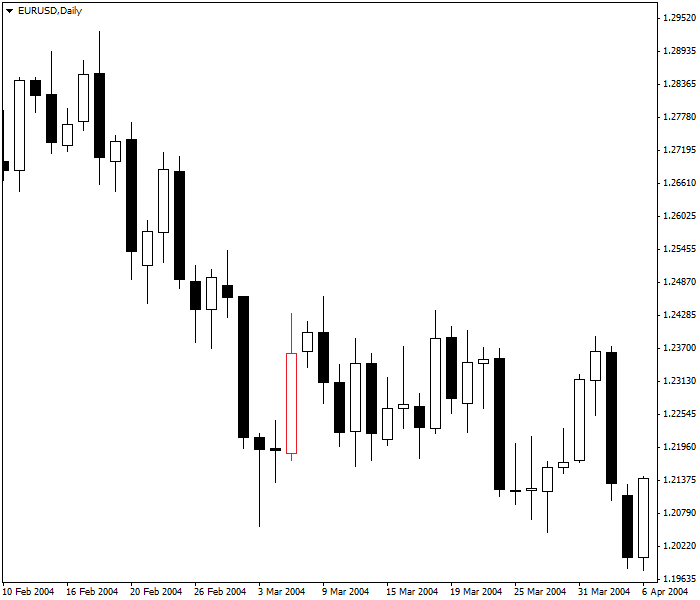 Effect of 2004 Madrid bombings on euro (red candle) is shown on this EUR/USD daily chart. These events lead us to deduce that an unexpected negative event will sometimes cause a currency to tumble, but not always. In the case of the 9/11 attacks, the Iraq War, and more recently the US financial crisis, the dollar remained surprisingly well-bid, at least in the short-term In this case, global investors wanted a safe haven and the US Treasury market, the largest and deepest in the world, provided them with this, and the dollar benefited even though the crisis was US-centric. Many times a news event comes in “on little cat feet” like the fog in Carl Sandburg’s poem. In late 2009, new Greek Prime Minister George Papandreou reported that Greece had been underreporting its budget deficit. EUR/USD, which started December 2009 above 1.5000, underpinned by supportive German Bund/US Treasury interest rate differentials, soon began to slip, but this was more about the uncertain eurozone outlook and profit-taking than any specific weight from Greece. The news about the true extent of Greece’s problems weighed on the euro, but most traders thought it would not be long-lasting. The euro ended the year in the low 1.40’s, and when 2010 came, the euro bounced back over 1.4500 versus the dollar. Many thought the worst was over. Then, other peripheral problems came to light and peripheral spreads began to widen sharply, making it difficult for Portugal, Italy, Greece, and Spain (dubbed the PIGS) to borrow, thus exacerbating the situation. By mid-2010, the euro was trading below 1.2000. Just like trading important data releases, good background knowledge is key in terms of trading news events. A trader needs to know the dates of all major central bank meetings and speeches by central bankers, especially central bank governors. A trader should be aware not only of the basic economic fundamentals of a currency, but also the country’s geopolitical situation and sovereign rating — and any warnings about ratings changes. Pro tip: It is better to go into expected big news with no position — square. We may get the expected knee-jerk reaction to news when it is as expected, but not always, and the effect is not always long-lasting. If professional trader tend to square up ahead of an important news release, why would smaller retail Forex traders think they know better? If you are serious about news trading and wish to automate the process, you can download one of the free news trading expert advisors available on our website: Amazing EA and News Trader. 1. A currency always falls in response to a negative news event. the USA is the ultimate safe haven. traders have a long-standing pro-dollar bias. the US government intervenes to prop up the dollar.